While the water level of the Seine recently reached such high levels that the basements of the louvre were evacuated and several villages in Germany flooded, the south of Norway experienced warm and sunny weather. With temperatures close to 30 degrees C the region was among the hottest in Europe. When it's warmer in a place like Voss than Mallorca, something extraordinary must be going on. Flooded quais in Paris also don't happen every day. Is this a consequence of climate change, and what can we do to protect ourselves agains it? First of all: it was so wet in France and Germany because a low pressure area stayed above central Europe for a relatively long time. As a consequence, the rain that fell saturated the soil, which caused the water from subsequent rainstorms to run off immediately. Floods are almost inevitable in such a case. So, bad luck with the weather and no climate change? Well, that's a false juxtaposition. Although climate and weather are two very different terms, they are connected to each other. The difference between the two was well explained four years ago in a short animation for the Norwegian television. In that animation, a dog and its owner are going for a walk. The dog, who's on a leash, jumps back and forth, and it's unclear where he'll be the next moment. Maybe he's sniffing a tree somewhere on the left, or he's running quickly to the right to bark at another dog. When you're just paying attention to the dog, his behaviour appears unpredictable. But his owner is going straight ahead, and when you pay attention to him it's abundantly clear in which direction the two are going. So, bad luck with the weather and no climate change? Well, that's a false juxtaposition. As you may understand, the dog represents the weather and the owner the climate. The weather can be wild and show a lot of variation in the short term. The climate is the trend in the long term. The long term is a lot more clear than loose examples. Recently, the German weather service released a rapport that showed that extreme precipitation has increased in Germany over the last 15 years. And this spring was the warmest ever recorded in Northern Norway, with 3 degrees above normal. Spitsbergen has been warmer than average for 66 consecutive months. In this way, we see that the climate slowly but surely changes, and it becomes more and more a reality rather than a distant future. That's why the transition to a sustainable society needs to continue without delay to counter the effects of climate change as much as possible. So invest in solar panels, water power and electric vehicles. Keep fossil fuels in the ground, instead of looking for new reserves in the Barents Sea. This is of course an often heard argument, which unfortunately hasn't been listened enough to, or on time. There is a concern that we're already too late to keep global warming below 1.5 degrees C - as wished for in Paris last year. The climate scenario's that foresee this, namely, require that we will extract CO2 from the atmosphere at one point instead of emitting it. But the technology to achieve this on a worldwide scale doesn't exist yet. The catch-up by solar and wind energy on the one hand, and research into e.g. artificial, more efficient, photosynthesis (chemical breakdown of CO2 with the help of sunlight) on the other hand offer some hope that a scenario with a negative emission may become a reality some day. But at the moment we need to consider that we will have to make some serious adjustments as a consequence of climate change. An emergency situation? 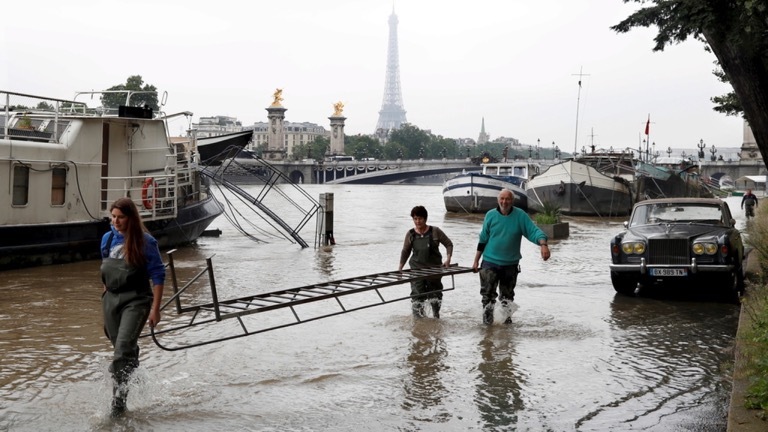 While Norwegians enjoyed the sun, Paris was hit by floods in early June. Situations such as these will occur more often. A better preparation for floods, for example. Although Norway had a lot of luck with the warm weather at the beginning of June, the same wet situation as in Central Europe can happen here as well. Climate models predict more rain in the future, primarily in the west of the country. Smart water management and more precise weather predictions can prevent a lot of suffering. In the low lying countries of Europe, such as the Netherlands, they give more room to water by controlled flooding of uninhabited areas - thereby sparing cities. And in various Norwegian cities there are tests with green roofs. The plants that grow on such roofs buffer a large amount of rain, which prevents it from flowing off immediately. But droughts will also keep occurring. And for a country that has so much hydropower it will be a big problem when water reservoirs aren't full enough. Besides, a persistent drought increases the risk of forest fires as well. Hopefully not at the same scale as the recent fires in Fort McMurray in Canada - but adaptation to climate change also means that people need to be prepared for such horror scenario's. Detailed policy plans for climate adaption do exist, also in Norway. The question is whether the implementation will be on time. The extreme weather in Europe, as we saw at the end of May and beginning of June, is an example of what has been hailed as a possible outcome of climate change for decades. The problem, however, is that such extreme weather always was seen as a distant future, and that we would have decades to prepare. But we don't have decades. It's happening now. When we notice, in addition, that climate record after climate record is being broken, it is clear that we surpassed the stage where we can truly and honestly question whether climate change doesn't exist. The time has come to prepare for a new climate reality. We need to accelerate current policy plans or, where possible, adjust them, and do our utmost best not to make the situation worse than it already is.